QuietsorbaTM ecopaint acoustic panels are high performance Class A sound absorbing panels suitable for wall and ceiling applications. They are pre-finished in a standard white colour with other colours also available. Used to absorb sound in environments such as schools, offices, leisure centres, community halls, hospitals, music and TV studios, churches and restaurants. These are Class A sound absorbers. Clean white gloves must be used when handling these panels to avoid marking them. The acoustic panels are installed using impaling clips and Gluesorba contact spray adhesive. This method allows the panels to be fixed direct to concrete, brickwork, wood, plaster, or metal. A site installation guide is sent with each delivery. The wall to which the Quietsorba acoustic panels are to be fixed must have a continuous solid backing wall surface, which must be level and ﬂat. The Soundsorba Impaling clips have 4mm diameter holes to take pan head screws. Using appropriate screws and plugs, etc. depending on your wall substrate, fix the correct number of impaling clips needed for the size of the panel. The larger the panel, the greater the number of impaling clips. Clean white gloves must be used when handling these panels to avoid marking them. 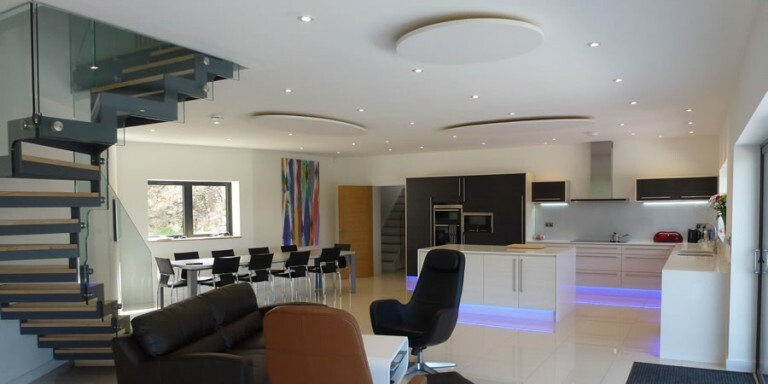 The installation time is fast as the Quietsorba ecopaint acoustic panels are simply suspended by steel wires from the soffit by means of special spiral hooks which are fitted in the rear of the acoustic panels. Also, this means that non-specialist fitters can be used to carry out the installation. The depth in suspension is simply changed by adjusting the length of the steel suspension wire. This also allows the panels to be installed at slightly sloping angles if required, again adding to the visual design possibilities. The spiral hooks should be placed between 200mm to 300mm from the edge of the Quietsorba panels. The suspension kit consists of a spiral hook and adjustable 2m cable. 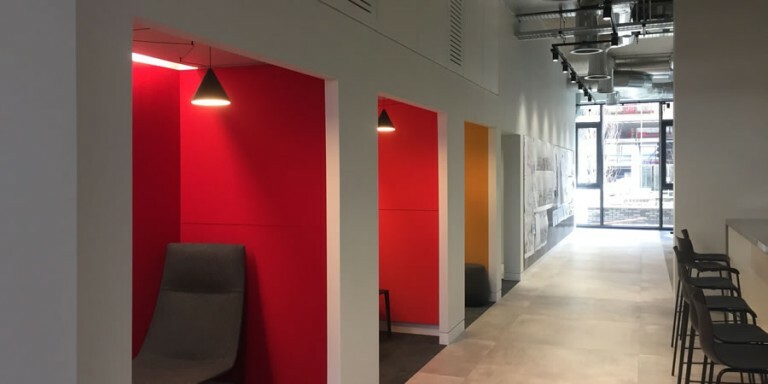 Quietsorba ecopaint acoustic panels come standard in white RAL 9016, but can be emulsion spray painted on site to any colour with little significant effect on acoustic performance. The panels can be painted for aesthetic reasons or even in the future to cover dirty marks. It is important that the paint is a water based matt emulsion and is applied in a very light mist spray coat so that the acoustics are not affected.